Tickets | Promo Code: NEXT for $5 off! ATB is the alias of progressive house/trance DJ and producer André Tanneberger, a native of Freiberg, Germany, born in 1973. 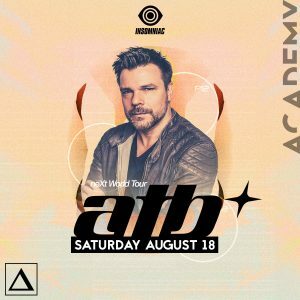 ATB’s catchy, vocal-driven singles crossed over from clubs to mainstream pop radio, making him one of the most recognizable artists of trance’s late-’90s/early-2000s commercial peak. He is best known for his first single, “9 PM (Till I Come),” a euphoric yet chilled-out progressive house instrumental featuring a smooth, distinctive guitar riff. This guitar sound became ATB’s trademark, but his lengthy discography has incorporated elements of ambient, drum’n’bass, and rock. His popularity has continued, earning him rankings in numerous international DJ polls, and he has a particularly strong following in Poland, where several of his studio albums and mix CDs have gone gold or platinum. Tanneberger started his career in the early ’90s, forming Euro-house group Sequential One in 1993. The group was moderately successful in Europe, releasing three albums and over a dozen singles until their dissolution in 1999. In the wake of remixes for acts including the Outhere Brothers, Technotronic, and Haddaway, Tanneberger began using the name ATB for his original solo material. He scored a major hit with 1998’s “9 PM (Till I Come),” which hit number one in the U.K. and went gold or platinum in a few other countries. Similar-sounding 1999 follow-up “Don’t Stop” nearly duplicated the success, and full-length debut Movin’ Melodies arrived later that same year. The album also featured the single “Killer,” a remake of the Seal and Adamski hit, with Drew Williams on vocals. The song was another smash hit, and began ATB’s successful run of vocal trance anthems.